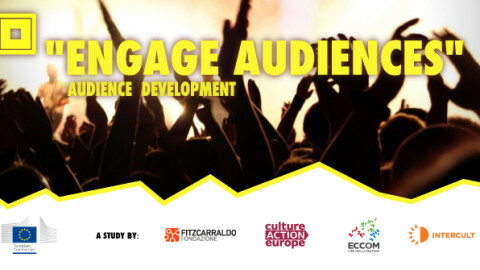 “Study on audience development – How to place audiences at the centre of cultural organisations” is a study by Fondazione Fitzcarraldo, together with Culture Action Europe, ECCOM and Intercult, as a consortium, developed in the framework of the Creative Europe programme. Task I – Desk research: creation of a relevant and comprehensive bibliography on the main issues of Audience Development. The working group will extract and analyze the main relevant ideas and topics stemming from the bibliography in order to create a canvas against which to situate the practices that will be studied in task II. Task II – Overview of practices: creation of a catalogue and a guide. The working group will identify a group of cultural organizations that have undertaken the transition towards a more audience-centric approach, that are worth disseminating and sharing at European level. The scope of the study is mainly small and medium-sized organizations that can be considered laboratories of experimentation, fostering innovation. The overview will result in an analytical catalogue and a practical guide showing how to make the transition towards an audience-centric organization step by step. Task III – Dissemination: The study will include a systematic communication and dissemination package in order to make sure that the main findings of the study reach the relevant culture professionals. “Audience Development. How to place audiences at the centre of cultural organisations” is a study promoted and commissioned through an open call for tender by the European Commission – Directorate-General For Education And Culture.